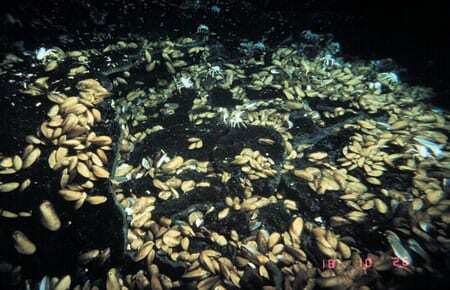 1998— When spectacular biological communities were first discovered at hydrothermal vents in 1977, biologists puzzled over two main questions: How did these oases of large and abundant animals persist in the deep sea, where food is typically scarce? And how did these unusual species, which occur only at vents, manage to colonize new vents and avoid extinction when old vents shut down? Efforts to solve the first question have resulted in fascinating insights into the chemosynthetic microbes that form the base of the vent food chain, as well as the physiological adaptations that allow the tubeworms, bivalves, and crabs to thrive. The second question, however, has largely remained an enigma. We do know that most of the species probably disperse between vents in a larval stage that drifts through the water, but we know very little about how this process works. Over the past two decades it has become clear that unraveling this mystery will require an interdisciplinary and cooperative scientific approach. The LARVE (Larvae At Ridge VEnts) Project was created to provide just such a collaborative framework for investigators from many different disciplines. LARVE is part of a larger program called RIDGE (Ridge Inter-Disciplinary Global Experiments), which is funded by the National Science Foundation to provide a coordinated, interdisciplinary research program aimed at understanding the geology, physics, chemistry, and biology of processes occurring along the global mid-ocean ridge system. At present, 10 principal investigators from eight different universities and research institutions are working in the LARVE team, and others are expected to join over the next few years. The goal of the LARVE Project is to investigate the processes by which larvae disperse through the ocean from one vent system to another. The LARVE Project aims to understand how these processes determine how far and wide species can migrate, how new vent biological communities are established, and how their populations become increasingly but differentially diverse. Answering these questions requires expertise in a variety of fields, including biology, chemistry, geology, and physical oceanography. The links among these fields are illustrated by following an example species, the vestimentiferan tubeworm Riftia pachyptila, through different stages of its life cycle. Riftia pachyptila reproduce by releasing eggs and sperm into the water. The fertilized egg then develops into a larva called a trochophore. The length of time a larva can survive in the water depends on its physiology—that is, how much lipid it has and how quickly it metabolizes this stored energy. Although the larvae use their cilia for slow swimming, their horizontal motion is determined largely by hydrodynamics, including fluid flows near the vents and larger-scale oceanic circulation patterns. However, larval behavior, such as vertical swimming, can position the larva in different flows and cause them to disperse at very different speeds and even in opposite directions. Larvae that survive the perils of predation and starvation in the water column must still locate a suitable vent habitat for settlement—possibly by responding to a chemical cue at a particular vent site. 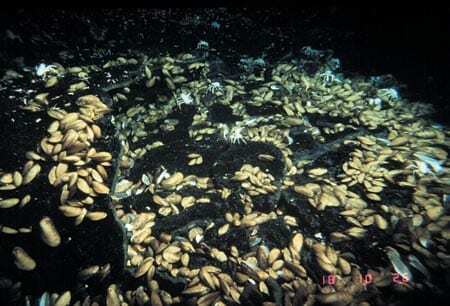 After a larva settles into the vent environment and metamorphoses into a juvenile stage, its survival is controlled by its physiological tolerances, nutritional requirements, and interactions with other tube-worm species, mussels, crabs, and fish that may be competitors or predators. Successful colonists contribute their genes to the population, and if larval exchange between two populations is frequent, this gene flow keeps the populations genetically similar. If, however, larval dispersal between two populations becomes inhibited, the populations may diverge genetically over time, and speciate (evolve into separate species). For their initial studies, LARVE Project researchers chose a site near 9°50’N, 104°17’W along an axial summit valley of the East Pacific Rise. The site is ideal because it consists of a chain of vents that support diverse and abundant communities of vent species. The bathymetry of this section of the ridge is well-surveyed, and the geochemistry of the vents has been monitored since 1991, when a well-documented volcanic eruption at the site wiped out the existing community and created a blank slate for a new community to form. Researchers are concentrating on the chain of vents in this area to study how species reproduce, progress through larval stages, settle at vents, and survive. Larger-scale studies of the gene flow and physical oceanography are conducted along the East Pacific Rise and elsewhere. We presently know a little about stages in the life cycle of a few different vent species, but we do not have a comprehensive picture of how extensively, in both distance and number, any single species can disperse. LARVE researchers have targeted several species for detailed investigations of the species’ entire life cycle: how they reproduce, how the larvae’s behavior and physiology interact with processes that transport them physically, how larvae settle at new vents in response to chemical or physical cues, how larvae survive in the complex chemical and biological environment of hydrothermal vents and how these processes contribute to gene flow. Selected species include two tubeworms (Riftia pachyptila and the smaller jericho worm, Tevnia jerichonana), the vent crab Bythograea thermydron, the mussel Bathymodiolus thermophilus, and several species of gastropods. The major challenge of the project is adapting techniques used to study shallow-water communities to the remote, deep-sea vent system, with its extreme pressures, high temperatures, and inhospitable chemistry. The field studies require delicate in situ manipulations by submersible, as well as recovery of live, undamaged specimens for shipboard experiments. The laboratory studies require incubating and observing larvae in chambers that must be maintained at ambient deep-sea pressures with precise control over the thermal and chemical environment. One of the more novel applications for laboratory studies of larvae is the design of two high-pressure systems for culturing larvae (photos at right). The system for behavioral observations consists of a cylindrical chamber outfitted with a viewport and illumination system. 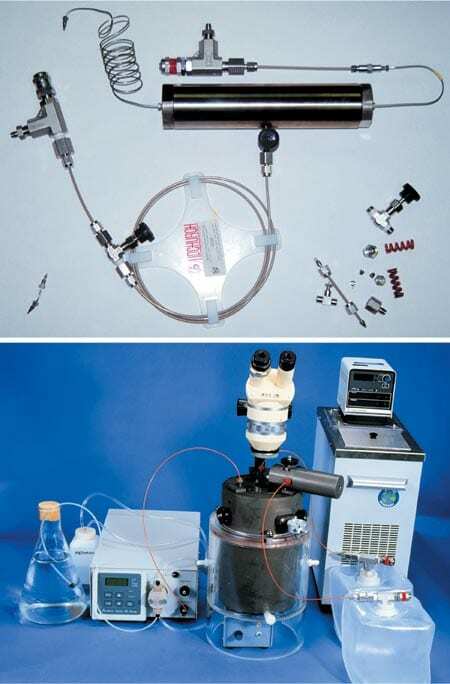 The chamber for physiological experiments is a smaller flow-through system that allows researchers to introduce fluid containing chemical tracers or to extract fluid and larvae for experiments and other metabolic measurements. Using these systems, investigators can explore questions about the energy stores and metabolic rates of larvae, and about the behaviors that may affect their hydrodynamic transport. Currents near mid-ocean ridges are affected by both ridge topography and buoyant plumes of hydrothermal fluids flowing from the vents. Preliminary studies using current meters moored along ridges indicate that currents are “steered” to run parallel to the ridge. Flow speeds, however, can be much faster at some heights above the ridge than others, and currents on the two ridge flanks may be oriented in opposite directions. Therefore, small movements by larvae, up or down, can have a substantial impact on the direction and speed of their dispersal. The hot, buoyant fluids flowing from the vents further complicate the currents by forming a plume that rises several hundred meters above the ridge. The earth’s rotation interacts with the buoyant plume to create a circulation cell within the plume that keeps some of the plume water near the source vent. If a larva becomes trapped in this spinning buoyant plume, it may recolonize the vent where it was spawned. To characterize larval transport in the specific flows near the 9°N East Pacific Rise study site, current meters have been deployed along the ridge axis, and future studies using neutrally buoyant floats are being planned. One type of larva, the late stage (or megalopa) larva of the vent crab Bythograea, may not need high pressure for study of some of its behavior. This astonishing larva has been kept alive for more than 10 months at surface pressure by Chuck Epifanio, Anna Dittel, and Craig Cary at the University of Delaware. During that time these researchers have been able to observe individuals metamorphosing into juveniles, providing a potential system for investigating how larvae may settle at potential vent sites in response to physical or chemical cues. Unfortunately, this pressure tolerance is uncommon in most vent species, and settlement cues for other species will have to be investigated under pressure, using laboratory culture chambers or in situ field experiments. Field experiments to explore how larvae settle at new vent sites and how juveniles survive are conducted with hundreds of simple, inexpensive basalt blocks deployed by the submersible Alvin, operated by Woods Hole Oceanographic Institution (WHOI). The blocks are placed within and away from vigorously venting sites for various periods of time to understand the effects of various environments and neighboring colonists on the survival of settling larvae. Some blocks are protected from crabs and fish by cages, and others have partial cages as controls, to examine the effects of predators on colonists (see photos, opposite). Large numbers of vent species’ larvae settle onto the blocks in a matter of months. The experimental design has been adapted to the deep-sea vents from classical studies of the rocky intertidal environment by investigators at WHOI (Lauren Mullineaux), Pennsylvania State University (Chuck Fisher and Steve Schaeffer), and the University of North Carolina (Pete Peterson and Fiorenza Micheli). By necessity, the experimental approach to questions of larval settlement and survival is conducted on small areas over short time periods. But obviously it would be valuable to make observations over many years. Time-series observations of undisturbed faunas are rare in the deep sea, but a 1-kilometer-long vent “sanctuary” was established after the 1991 East Pacific Rise eruption, allowing Rich Lutz’s lab at Rutgers University to monitor changes in vent communities for almost a decade. This monitoring is done with time-lapse cameras left at individual vents and repeated camera surveys conducted with Alvin and the remotely operated vehicle Jason. Studies of genetic exchange between vents started soon after vents were discovered and continue along the East Pacific Rise and elsewhere in the world’s oceans. Studies on the species targeted by LARVE are currently under way as part of the effort by Bob Vrijenhoek’s group at Rutgers to understand genetic exchange on a regional and global scale. The intent is to identify vent populations that have significantly different genetic compositions and to characterize how these populations are separated geographically. Are they separated by a few kilometers between neighboring vents? Or by gaps between segments of the ridge? Or by an ocean basin or a continent? This information will then be compared to predictions, based on the larval studies, of which geographic features may pose barriers to dispersal and, therefore, gene flow. The first cruises specifically associated with the LARVE project went to sea in 1997, and about 10 cruises are expected to visit the East Pacific Rise through the year 2000. The field observations and data are essential ingredients for subsequent theoretical studies that will lead to a cohesive understanding of the complex processes that allow such a wealth of life to thrive on the bottom of the ocean. Funding from the National Science Foundation and support from the RIDGE office helped the LARVE Project metamorphose from idea to reality. Lauren Mullineaux first became interested in the ecology of hydrothermal vent systems during the early 1980s as a graduate student at Scripps Institution of Oceanography in Robert Hessler’s lab, a hotbed of pioneering work on vent communities. He (wisely) counseled her to choose a less risky project for a thesis, but the fascination with vents was solidly in place. After arriving at WHOI she jumped at the chance to study larvae of vent species during a cruise along the Juan de Fuca Ridge with Ed Baker (NOAA) and Peter Wiebe (WHOI). Now, many cruises and Alvin dives later, she still gets a thrill from visiting vents in person, but an even greater satisfaction from witnessing the inspiration and excitement of another scientist on his or her first sojourn to a vent. Born and raised in Ireland, Donal Manahan became interested in marine biology and the study of larvae as an undergraduate working on oyster culture in Ireland. As a graduate student at the University of Wales in the UK, he studied larvae metabolism, specifically questions such as how much energy larvae need to grow and how they get that energy from the ocean. He came to America in 1980 as a postdoctoral researcher at the University of California, Irvine. He has expanded his interests to study how animal life develops in extreme environments, such as Antarctica. That naturally drew him to investigate the early stages of animals that survive being cold and hungry at another similarly extreme environment, hydrothermal vents. Although the vents themselves are very hot, the seawater just a few feet away is very cold, and like polar regions, has no obvious source of food. 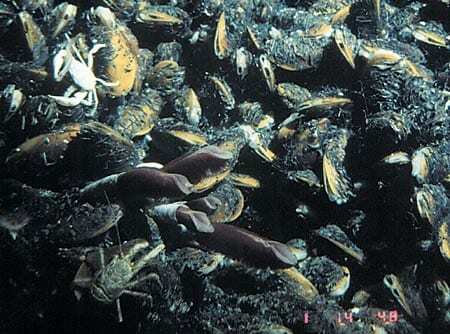 To learn how deep-sea vent species disperse through the ocean and colonize new hydrothermal sites, researchers in the LARVE Project are investigating the complete life cycles of several species, including three in the photo above: the tubeworm Riftia pachyptila, the vent crab Bythograea thermydron, and the mussel Bathymodiolus thermophilus. A syntactic foam float marks the location of an experimental block amid a colony of the tubeworm Riftia pachyptila. The life cycle of Riftia pachyptila illustrates the complexity of factors—involving biology, chemistry, geology, and physical oceanography—that all play roles in the migration, resettlement, and speciation of vent species. Newly designed high-pressure systems for culturing vent species? larvae allow scientists to examine the behavior, energy stores, and metabolic rates of larvae, which all contribute to their ability to survive migration to new vent sites. 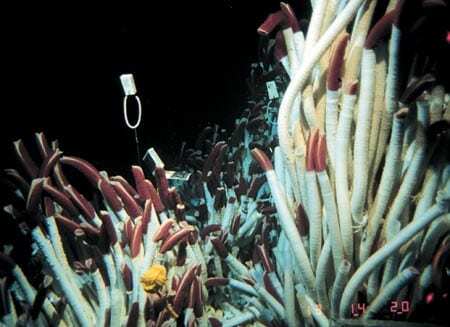 A vent colony of the serpulid polychaete Laminatubus alvini thrives near a hydrothermal vent. A few galatheid crabs (Munidopsis subsquamosa) wander amid a thriving colony of Bathymodiolus thermophilus mussels. Scientists have deployed hundreds of basalt blocks (left) within and away from vent areas for various periods of time to learn how larvae settle at these sites. Some blocks are protected by cages (center and right) to determine the effects of predators on colonists. 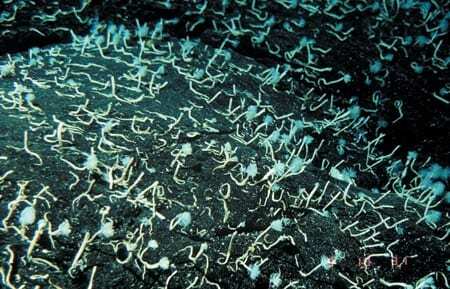 At right, a block has been colonized by vestimentiferan tubeworms after 13 months on the seafloor.